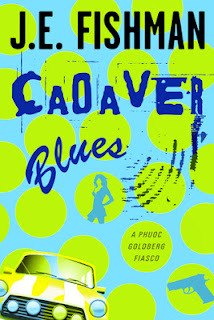 Cadaver Blues is the first book featuring J.E. Fishman’s character Phuoc Goldberg (Phu) – an American of Vietnamese origin, debt consultant by profession based in Delaware, someone who is very sensitive about his name, owing to its actual Vietnamese pronunciation and also has a problem in controlling his temper. He is approached by Melissa Eider (Mindy), who drove all the way from Minnesota in search of her elderly uncle Gunnar Karlson – who has defaulted on his debts and his bank is about to acquire his house. Phuoc initially is only interested in his consulting fee to fulfil his obligations regarding the rent but eventually, he gets more involved and even starts playing detective, with him trying to find Karlson along with Mindy. This story was narrated by Phuoc – from a first person perspective and I enjoyed that, as I don’t come across such books too often. Moreover, I found this to be a different kind of detective story, with hardly any professionals involved which was rather interesting. Like in any other good mystery novel, it had a fair share of twists and turns, very good ones, if I may say so. The most enjoyable part of the whole thing was Phuoc’s character – his sarcasm and cynical approach did contribute to lighter moments, even during the more serious phases of the novel. The change in Phuoc’s attitude was shown well – one significant thing I found, as mentioned by the publisher – ‘his assumptions about young blacks’, I’ve always believed that nobody is going to change just because you tell him /her to dismiss their racist thoughts, instead, they certainly would, if they’re pleased with the attitude of even one member from the community / race. Apart from that, I enjoyed the description of the various settings in the story, especially the mushroom farms. However, on the other side, the starting in this book was slow. Yes, Mindy was introduced immediately and Phuoc also tried his best to retrieve the house but, for the first 150 pages, I felt that it was going nowhere. I don’t know whether changes have been made in the subsequent publications but I did find a couple of editing mishaps in my edition. Moreover, I found Mindy to be a way too compassionate, which at times, didn’t sound very practical. Cadaver Blues has laid a strong foundation for the Phuoc Goldberg Fiasco. However, I’m not sure whether in the sequel (Ruby Red Dead), Phuoc is going to have a challenge in his profession or again, somewhere outside the scope of his work. I’d just have to wait. I award good books, or sometimes even average books, a six but since I enjoyed this book far more than so many of those books for which I’ve given a six rating, I’d give it a seven on ten. Here is the review of the much anticipated finale of the Danish political drama, Borgen. If you haven’t watched the previous seasons, the reviews of season 1 and season 2 are available in this blog. Birgitte Nyborg loses the election; Lars Hesselboe is the prime minister. She is back in the corporate world and Jacob Kruse is now the head of the Moderate Party. However, she is not satisfied with the policies of the current government and is unable to stay away from politics for too long. She challenges Kruse for leadership in the Moderate party, unsuccessfully and then, floats her own party with some MPs, with Katrine Fønsmark as her spin doctor. This is an angle that I had been longing for, in Borgen, for the reason that the viewers have had the opportunity of seeing Birgitte only as the prime minister and never as a member in the opposition and so, finally, we have it. The New Democrats, as her party was called, attacked the government with regards to several policy decisions and towards the end, also had a good election campaign. Torben Friis had a far more significant role in this, and the focus was on the squabbles with the new young programme director, Alexander Hjørt. I liked the fact that it had a lot more TV interviews, lot more confrontations and focus on personal lives of individual politicians became less in this season of the series. However, I wanted to see more of Laugesen in this season, but yet again, he had such a trivial role, even less than what he had in the previous seasons. Episode six was very disappointing, and it was more like filler as all it had was Søren Ravn, an economist and a former communist joining the New Democrats and the media hounding his past. Moreover, I never understood as to why the writers wanted to make Birgitte Nyborg more and more like Helle Thorning-Schmidt – first female prime minister of Denmark (though, Thorning-Schmidt achieved it after Nyborg did) and with a British partner (Jeremy Welsh and Stephen Kinnock, respectively). But the most significant drawback of the whole thing is the lack of Kasper Juul, whose role was minimal, with only his thirty second appearances in the programme of TV1, ‘Juul and Friis’ and also, Katrine wasn't even half as good as Kasper at the job of being a spin doctor. The finale, to summarise, had good content in its episodes (barring 6), with Nyborg leading a small party, trying to have a say in Danish politics. The finish was not exactly noteworthy but it wasn’t abrupt either, and every important character was given a closure barring Kasper Juul and to an extent, Philip Christensen. I’d put this at the same level as season two with a rating of eight on ten. I’d also be writing a summary on the whole series, soon, which would naturally contain spoilers.